Bask in the quaint and luxurious charm of a delightful San Juan Islands WA Bed and Breakfast. Start the day with a delicious breakfast, pop in for late afternoon tea, discover local character and hospitality, and relax with the comforts of home in one of the nearby San Juan Islands Washington B&Bs. 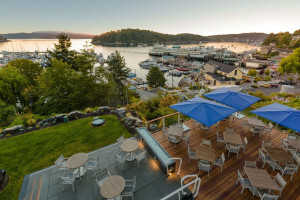 Scenic San Juan Island accommodations with panoramic views of the harbor. Our charming rooms and on-site restaurant provide the perfect way to unwind at the end of your day. Relax in the peace of nature at this unique and comfortable inn. This Friday Harbor B&B offers privacy and nearness to all the downtown amenities and services. The homey atmosphere at this comfortable inn are sure to charm you. Pets are welcome. Enjoy the rustic elegance of this historic inn in beautiful deer harbor. The ridge top location for this delightful in offers great views and quiet. Centrally located in Lopez Village this beautiful inn is the perfect place to stay within walking distance of everything the village can offer. This attractive, eco-friendly and historic B&B takes inn keeping to a new level, you may not want to leave. The modern comforts at this charming inn will make your island vacation even more enjoyable. Use this comfortable craftsman inn as your base camp as you explore beautiful Orcas Island. This historic inn has lovely views over a protected bay. Enjoy the delicious food of the in house restaurant. This historic Island residence makes a wonderful B&B, offering classic lodging, modern amenities and full breakfast. Relax in a lovely rural setting with easy access to nearby Lopez Village and parks. Located on the beautiful and less populated end of Lopez Island this waterfront inn is close to many great hikes. This charming inn is set among the pastoral beauty of San Juan Island, and is open seasonally. Relax next to the lily pad covered pond at this woodland inn. This luxurious and charming inn is located within walking distance of Eastsound. Enjoy the privacy and amenities available at this small compound of cabins and suites. This Japanese style inn is open seasonally for a gracious and unique Island experience. This B&B has stunning views off the high west side of San Juan Island. The classic comfort of this elegant inn is sure to make your island vacation even more special. The pastoral setting of this charming inn is just minutes from the shops and restaurants of Friday Harbor. The unique atmosphere at this rural inn is just part of its gracious charm. Nearby Turtleback Mountain offers great hiking. Connect with travelers planning a visit to San Juan Islands Lodging.